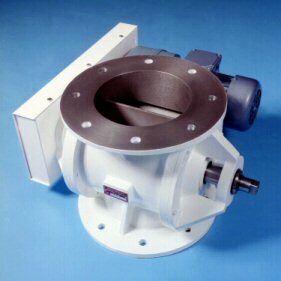 We can cater for rotary valves for all applications from feeding non-abrasive food products by gravity to extremely abrasive products that could not normally be handed using a rotary valve. The basic blowing seal is ideal for low abrasion products such as wheat flour and is used extensively in bakeries. For medium abrasive products the RBS heavy duty blowing seal has features that give longer wear life. For very abrasive products the TWA rotary valve has an enviable track record and is, we believe, the most abrasion resistant valve on the market today. For the unltimate in longevity the TWA can be fitted with alumina ceramic wear parts. The MV valve is idea for general purpose gravity applications. Where poor flowing products are handled, the SR easy flow valve has a straight drop in and out without any restrictions to prevent the product bridging or hanging. Where lumpy materials are being handled, MID produces the only offset on the market that can handle up to 50mm lumps without damage. A true side feed, allowing the product to settle in the pocket before moving round the valve stops the rotor tips from "chopping" the product. And of course all of our rotary valves can be fitted with the renowned ultra-reliable maintenance free mechanical shaft seals, dramatically reducing maintenance and downtime.